After more than 30 years, the Terminator franchise continues to chug along with the fifth film in the series: 2015’s Terminator Genisys. In the year 2029, humans led by John Connor (Jason Clarke) fight against a powerful artificial intelligence called Skynet. During that period, the humans learn Skynet will try to alter the past. Connor sends Kyle Reese (Jai Courtney) back to 1984 to protect his mother Sarah (Emilia Clarke) from an attack by a cyborg called a “Terminator”. So far, so familiar for anyone who saw the original movie. Genisys makes its own fate when Kyle arrives in 1984 and the audience finds he resides in a world already affected by time travel. In this chronology, the resistance sent its own terminator (Arnold Schwarzenegger) to defend her in 1973, and she still uses him for protection in 1984. We follow their relationship as well as the altered connection between Kyle and Sarah and related concerns as those involved continue to fight against potential Armageddon. As a fan of the series, I think the most entertaining moments here come from those that explore the alternate timeline. Genisys rewards viewers who recall the prior flicks, with an emphasis on the first two, of course. Genisys manages to call back moments from those flicks – especially the 1984 original – and tweak them in clever ways. It’s also fun to see Schwarzenegger back as the Terminator. 31 years after the first movie, this remains his defining role as an actor, and he continues to do well in the part. While I think the story stretches credulity to allow the 67-year-old Schwarzenegger to play a presumably ageless character, I don’t really care. Schwarzenegger brings what he needs to the role and adds credibility to the proceedings. Otherwise, Genisys offers a mixed bag – a statement I could assign to all of the sequels after 1991’s Terminator 2. I think that one remains the best of the series, and it looks better and better compared to its flawed sequels. Actually, I mostly liked 2003’s Terminator 3, though I admit it may not hold up terribly well 12 years down the road. When I saw it in 2003, I think I felt so relieved that it wasn’t bad that I may have overpraised it. While it’s an enjoyable movie, it’s not nearly as good as the first two. Still, T3 tops the erratic and messy Terminator Salvation. I do like parts of the movie and find its exploration of the “Future War” – mostly alluded to in the prior three films – to be interesting, but the flick doesn’t coalesce in an especially satisfying manner. That becomes true for Genisys as well, partly because the alternate timeline tale turns so clunky. All Terminator flicks suffer from paradoxes that make one’s brain ache, and this turns even more evident in Genisys. It comes with so much mind-bending time travel material that the end result turns into a mushy morass of chronology. I can’t say I’m entirely wild about the new cast, either. Actually, Courtney does better than expected as Kyle. He’s no Michael Biehn, but he acquits himself pretty nicely and gives Kyle good dimensionality. I’m also happy to see the always-enjoyable JK Simmons as an old-time police detective; he brings charm to his underwritten role. Neither Clarke does a lot to impress, unfortunately, and Emilia becomes a substantial weak link. Though the film gives us the Sarah of 1984, the Sarah of Genisys bears a greater resemblance to the hard-bitten warrior of T2. Emilia can’t deliver the tough as nails vibe Linda Hamilton brought in T2 - and she doesn’t even come close. Emilia always feels like a little girl playing tough. She offers an impersonation of a cartoon version of a battle-hardened Sarah, one with little heart or personality. That leaves a hole in the film. These flaws don’t turn Genisys into a bad movie, but they ensure it comes with too many ups and downs. Parts of Genisys entertain – especially in its first act – but the final result lacks consistency and becomes an erratic piece of work. Footnote: hang around through the middle of the end credits for a snippet that teases a potential sequel. 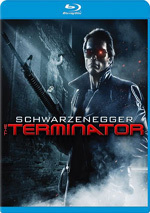 Terminator Genisys appears in an aspect ratio of approximately 2.40:1 on this Blu-ray Disc. This was a good but not great presentation. Sharpness was mostly positive, but inconsistencies occurred, which meant occasional shots seemed a little soft. Those remained modest, though, which left most of the film accurate and concise. Neither shimmering nor jaggies emerged, and the image lacked edge haloes. Print flaws also failed to materialize. The film’s palette leaned teal, but the movie also incorporated magentas and yellows. These demonstrated good clarity within design parameters. Blacks showed nice depth, and shadows were fine; some low-light shots appeared slightly flat, but not to a substantial degree. This usually brought us an appealing transfer. I felt more satisfied with the active Dolby Atmos soundtrack of Genisys. Because I don’t have an Atmos-equipped system, this played back as a Dolby TrueHD 7.1 mix, and it gave us an exciting presentation. One expects a lot of action from a Terminator film, and Genisys delivered. From beginning to end, the story came with plenty of chances for information from all the channels, and the mix made fine use of those moments. The elements blended together well and provided dynamic audio all around the room in a way that combined to pack a good punch and place the viewer inside the action. Audio quality worked well. Music was rich and dynamic, while speech seemed concise and distinctive. Effects added power, as those elements appeared accurate and exciting, with clean highs and deep lows. The soundtrack became a strong part of the experience. Three featurettes appear here, and we start with the 15-minute, 51-second Family Dynamics. It offers comments from producers Dana Goldberg and David Ellison, director Alan Taylor, writers/executive producers Laeta Kalogridis and Patrick Lussier, and actors Jason Clarke, Emilia Clarke, Matthew Smith, JK Simmons, Jai Courtney, Arnold Schwarzenegger, and Byung-Hun Lee. They discuss cast, characters and performances. A few decent notes result, but much of the content veers toward fluffy praise. Next comes Infiltration and Termination. In this 25-minute, 29-second show, we hear from Taylor, Goldberg, Ellison, Schwarzenegger, Lee, Emilia Clarke, Kalogridis, Lussier, Jason Clarke, Courtney, Simmons, Smith, cinematographer Kramer Morganthau, and production designer Neil Spisak. The program covers sets/locations, stunts and action, allusions to earlier films and story/character domains, cast/performances, and Taylor’s impact on the production. “Infiltration” offers more substance than “Dynamics”, but it still lacks much heft. That leaves it as a decent but thin overview. Finally, we find the 15-minute, seven-second Upgrades: VFX of Terminator Genisys. 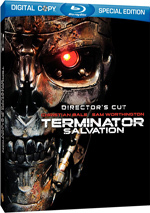 It gives us notes from Ellison, Goldberg, Taylor, MPC VFX supervisor Sheldon Stopsack, Double Negative VFX supervisor Pete Bebb, lead CG artist Jamie Daydock, sequence supervisors Isaac Layish, Davis Lee and Maxx Leong, lead CG artist Andrew Williamson, CG artists Gerald Blaise and Tobias Keip, and filmmaker James Cameron. As expected, “Upgrades” concentrates on the visual effects used in Genisys. It delivers a perfunctory but informative view of the material. A second disc provides a DVD copy of Genisys. It lacks any of the Blu-ray’s extras. 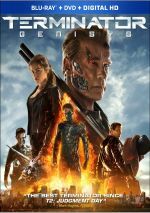 For the fifth entry in the series, Terminator Genisys delivers a watchable but erratic film. Though parts of it work pretty well, the package as a whole seems inconsistent and underwhelms. The Blu-ray offers excellent audio along with generally good picture and a few moderately informative bonus materials. Genisys brings us a sporadically entertaining but not top-notch Terminator adventure.